The thread woven throughout our gospel this weekendâ€¦is a thread of LIFE, born from faith and humility. Yes, new life is seen sprouting forth from both Jairus’ daughter and the woman with the hemorrhage. Both were staring at the glare of deathâ€¦like we do so often, don’t we? Each one of us can understand this painful, human situation because we’ve either watched a loved one slowly lose life, or we ourselves have experienced the drain of a life-threatening illness. We can all identify, then, with the desperation of the father, Jairus, or of the old woman. Both are staring death in the face. And as they stare at death, they catch sight of Jesusâ€¦the Lord of life. 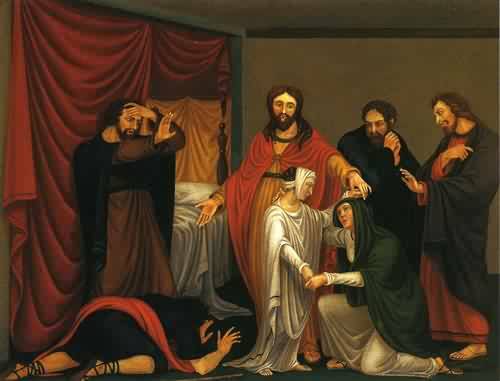 Both Jairus and the woman, each in their own way, receive a spirit of humility as they approach Christ: Jairus falls at Jesus’ feet, while the woman secretly approaches from behind. And from their humility, both then demonstrate faithâ€¦thus, both have their wish for healing granted. A moment earlier, death was encroaching upon them, but in an instant of humble faith and petition, death is turned back. This week, let us strive to reach out and grasp the gift of life offered by the Lord. Like Jairus and the old woman, we too can approach the almighty and find the generous offer of life. All we need do is muster the humility and faith necessary to reach out to Christ’s abundant loveâ€¦for such faith leads to our salvation.